The industrial town of Walsall is located about 9 miles North-West of Birmingham city and about 7 miles east of Wolverhampton. The city is right in the middle of main West Midlands of England and has been known to provide goods and supplies in the region because of the huge industrial presence in the town. For all the Walsall people and their homes or other commercial interiors, Impress Blinds offers beautifully bright windows blinds that can also provide dark and cozy rooms for unusual shift workers. Impress Blinds offers Cheap Window Blinds that are made from different materials and are installed with different window covering styles, making windows look great and provide enhanced functionality of daylight and outside temperatures control. For all the commercial or domestic interiors where daylight maximization is a priority, our beautiful and elegant Vision Blinds are the best option with their surface perforated designs that let in light and fresh air all the time, Cheap Roller Blinds are perfect for extra design oriented rooms where thematic printing is required, quality Vertical Blinds bring that unique touch to any wide set of windows or special Conservatory Blinds are available in different materials and all colors to make your conservatories in Walsall much more functional. To have a look at Impress Blinds’ Roman Blinds that are perfect for fabric printed designs, Metal Venetians that are made from real aluminum strips, Cheap Wooden Blinds that have real wood stripes shone to perfection with efficient polishing or the perfectly window shutting Velux or Shutter Blinds. Get perfect Made to Measure Blinds from our expert hands and get maximum functionality from your windows while making them look great as well. 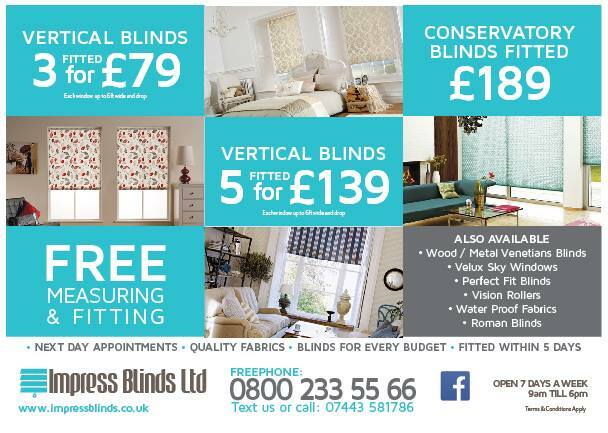 Impress Blinds has been providing windows blinds in West Midlands of England including Walsall for decades and have become the most trustworthy supplier in the region. We offer many different thematic windows blinds with supportive printed or material designing and perfect design matching or contrasting options. Complement your conservatories or other rooms with wood heavy design themes with Wooden Blinds or go the fabric way with Roman Blinds. Top quality metal venetians are also offered in all color combinations or you can also get the elegant Roller Blinds with perfect thematic prints on them designed just for you. Why hold back on your design senses in Walsall? Go bold as much as you want and make that statement with our Vision Blinds or go the more traditional way with unique Vertical blinds. Bold and beautiful options are our specialties and we also provide completely unique printed designs or color combinations with surface finishes according to our client’s specific requirements. Our Design Your Own Blinds service provides custom personalized designs that are made on request and are all finished with highest level of attention to detail. Choose vertical sliders, horizontal covers, bold shutters, always one vision blinds or peak a view metal venetians and match or contrast them in terms of color, design or finish with the rest of your interiors with perfect blinds provided by Impress Blinds. What We Offer in Walsall? Most supermarkets or other windows blinds sellers offer you prepared blinds that you take away from them and have to install them yourself or call up your own service in Walsall. That is not how Impress Blinds works however, to start off, we offer free window measurement services. Not all of you will be as handy with measuring tapes and unequal or non-uniform corners and sides as some of our skilled experts, which is why we send out experts to take precise window measurements right at your location in Walsall, who then order your specific windows blinds based on those centimeter perfect measurements. That is not where our perfect services in Walsall end, once your specific windows blinds are made and ready, we bring them down to your location and also offer free installation services. Free installation and free window measurement services are what separate us from the rest in the market and we never compromise on quality whatsoever for any of our high quality windows blinds products. Our major clients in Walsall (UK) are much satisfied with our services.